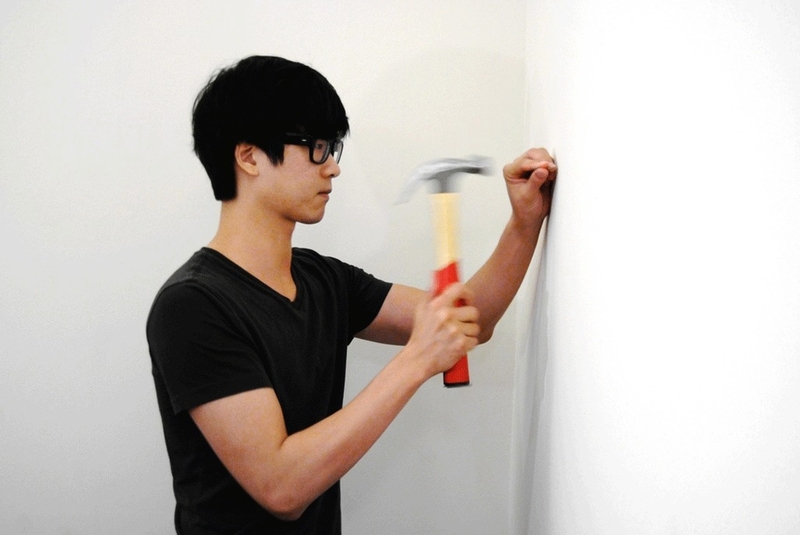 By attaching magnets on the handle of the hammer, the user no longer needs to carry nails in an uncomfortable fashion: simply bring Neo to a pile of nails. Out of many different ways of holding nails on the hammer, such as magnetizing the head of the hammer, making holes to plug in nails in the handle, carving out a portion of handle to embed magnets, and etceteras, simply drilling on the bottom of the handle was the final decision of the design (informed by the practicality and simplicity of manufacturing and product usage, and the behavior of magnets against strong impact). By testing with different prototypes using different numbers, placements, and the strengths of the magnets, the configuration that holds enough nails in an organized way is found to be Configuration #5. Graphic treatment study for rubberizing the handle. © Jung Soo Park 2019. All rights reserved.